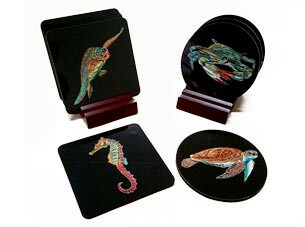 Custom Coasters - Great Personalized Gifts! Our Custom Coaster sets are constructed of gloss white hardboard with a cork bottom. They are available in square or round shapes and make great personalized gifts with your artwork or photos. Promote a business or add the finishing touch to any party. The mahogany slotted holder (included) fits four coasters to help store and display them neatly.